Second in a series inspired by a walk in the National Trust Garden Sheffield Park in East Sussex, where the bright greens of early summer trees are reflected in a series of long man-made lakes. The rhododendrons and azaleas glimpsed in the distance are spectacular and clematis scramble up trellises and through sun-dappled foliage. 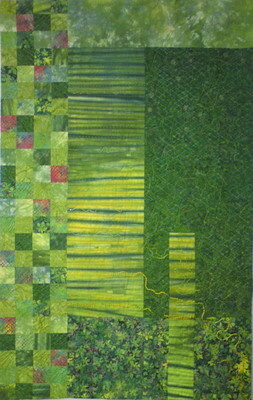 This quilt was selected for the Quilters' Guild and ICHF touring exhibition Summer in the Park. 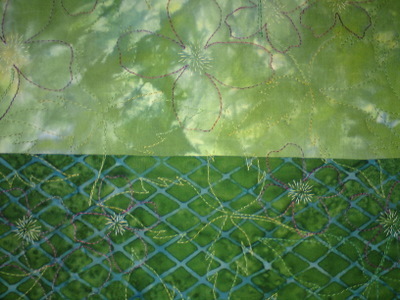 Materials: Hand dyed and commercial batik cotton fabric; hand dyed and commercial threads. 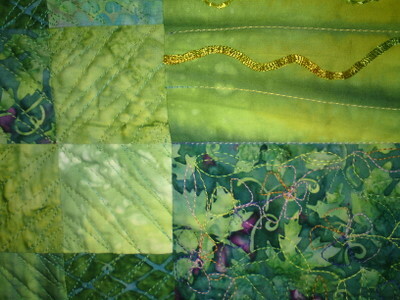 Method: Machine pieced; hand and machine quilting.